OK, so I'm not much of a Tiger fan. When he was playing regularly, I rooted for him to put the ball in the drink or far into the gorse. When he got busted with the floozies, I considered him a sleazebag and cut him no slack. 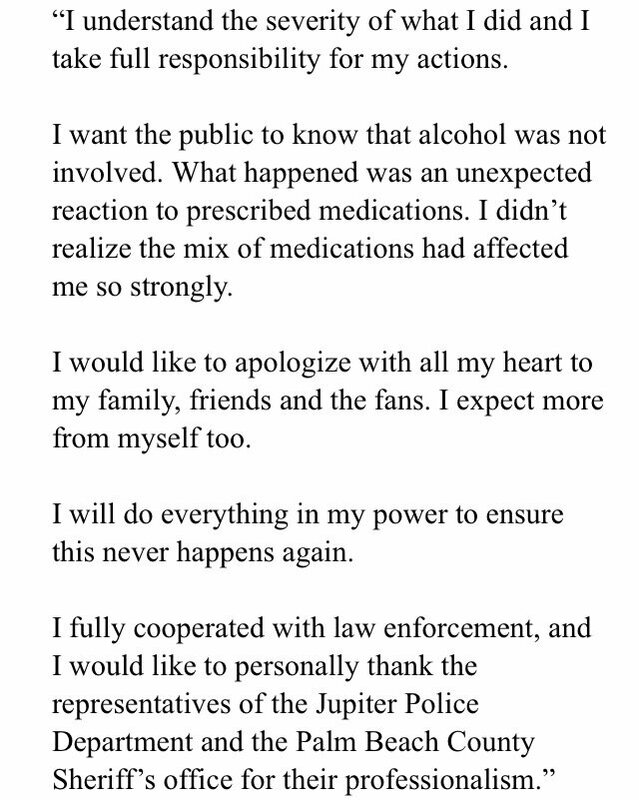 But really - he got arrested, in Jupiter, for DUI when he blew no alcohol and everybody in the world knows he has a back problem and recent surgery? No, he shouldn't have been out driving himself around. I'm sure numerous people would have been happy to give him a ride. Or he can't afford a driver anymore? Uber doesn't run in Jupiter? But still, given the knowledge they had, and that he did no harm to anything but his own long-suffering car, couldn't the cops have just taken him home? Probably the charges will get dismissed, but in the meantime he's been trashed unnecessarily. I wasn't there, but an arrest is fairly standard if you're passed out in your car and you fail the field sobriety tests. DUI isn't just booze. Anyone know how it works for cops these days? Could the cops have just taken him home without documenting why and subjecting themselves to scrutiny? It's routine for me to tell folks not to drive while taking certain meds, can't say if he received the same caution. That said, I benefited from growing up in a more tolerant era. I got warnings, but fortunately never got a ticket or arrested AND I never wrecked. I once drove home followed by a concerned friend. Made it to my driveway . . . then she woke me up because I immediately passed out while still in the car. That one scared me into being more responsible. Yes, he's technically in violation - the "I" in DIU is "influence" and includes drugs - even prescribed ones. But it just seems like there are circumstances here that might not have required an arrest. But I suppose the cops feared the reaction if they didn't take him in and got caught at it. Could be that Joe Schmoe gets laxer treatment than a celeb in some of these situations because of potential claims of favoritism. I've never been comfortable with the automatic bust if one is sleeping in a car altered. Say someone comes out of a bar drunk and has no other option than to sleep it off in their car, which is the responsible thing to do. Seems to me there ought to be some flexibility. If it was me I would climb into the backseat in hopes of making a stronger case that I had no intention of driving. However, I wouldn't argue that booze should be seen as worse than Rx meds. Altered is altered. Last edited by Vrede too on Wed May 31, 2017 9:52 am, edited 1 time in total. It may have been that the car was still running. If he'd been asleep in the car in a parking lot or space, car shut down, it probably would have been different. My guess. ... If he'd been asleep in the car in a parking lot or space, car shut down, it probably would have been different. My guess. Could be, I've heard of people being busted for that, but we're less likely to ever hear of that were let off for that.